BENTON, Ky. (AP) — A 15-year-old student killed two classmates and hit a dozen others with gunfire Tuesday, methodically firing a handgun inside a crowded atrium at his rural Kentucky high school. “He was determined. He knew what he was doing,” said Alexandria Caporali, who grabbed her stunned friend and ran into a classroom as their classmates hit the floor. He kept firing, she said, until he ran out of ammunition and took off running, trying to get away. Police arrested their suspect moments later, leading him away in handcuffs to be charged with murder and attempted murder. Authorities did not identify the gunman responsible for the nation’s first fatal school shooting of 2018, nor did they release any details about a motive. Kentucky State Police Lt. Michael Webb said detectives are looking into his home and background. “He was apprehended by the sheriff’s department here on site, at the school, thankfully before any more lives could be taken,” Webb said. Seventeen students were injured, 12 of them hit with bullets and five others hurt in the scramble as hundreds of students fled for their lives from Marshall County High School. Many jumped into cars, or ran across fields and down the highway, some not stopping until they reached a McDonald’s restaurant more than a mile away. Parents left their cars on both sides of an adjacent road, desperately trying to find their teenagers. “No one screamed. It was almost completely silent as people just ran,” said Caporali, 16. She said most students knew what to do because they are drilled throughout the year on how to respond to an active shooter at school. 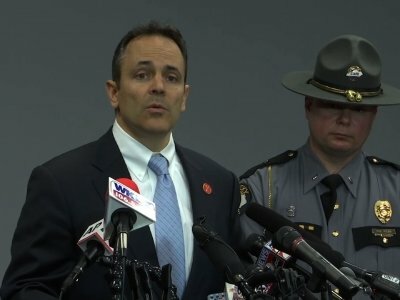 The two fatalities were 15 years old: Bailey Nicole Holt died at the scene, and Preston Ryan Cope died later at a hospital, Kentucky State Police Commissioner Richard Sanders said. Cope was among six young men flown about 120 miles (193 kilometers) to Vanderbilt University Medical Center in Nashville, Tennessee. Sanders said the five others were in critical condition Tuesday night. The attack marked the year’s first fatal school shooting, 23 days into 2018, according to data compiled by the Gun Violence Archive, which relies on media reports and other information. The anti-violence group Everytown for Gun Safety has counted at least 283 shootings at schools since 2013. Kentucky Gov. Matt Bevin and several people in Benton said they couldn’t believe a mass shooting would happen in their small, close-knit town. But many such shootings across the nation have happened in rural communities. Meanwhile, in the small North Texas town of Italy, a 15-year-old girl was recovering Tuesday after police said she was shot by a 16-year-old classmate in her high school cafeteria on Monday, sending dozens of students scrambling for safety. Police in Louisiana, meanwhile, are investigating shots fired Monday as students gathered outside their charter school. “It’s horrifying that we can no longer call school shootings ‘unimaginable’ because the reality is they happen with alarming frequency,” said former Rep. Gabrielle Giffords, who survived being shot in the head in 2011. She called on Congress to strengthen gun laws. Tuesday’s shooting, moments before classes would have begun, disrupted some happy moments in the noisy “commons” area at the center of the school, where several hallways meet and students gather between classes. Lexie Waymon, 16, said she and a friend were talking about the next basketball game, makeup and eyelashes when gunshots pierced the air. Her friend, Baleigh Culp, told the AP in a text message that they were joking and laughing until they heard a loud bang that sounded like someone’s books hitting the floor. Waymon did not stop running either, not even when she called her mom to tell her what happened. She made it to the McDonald’s, her chest hurting, struggling to breathe. “All I could keep thinking was, ‘I can’t believe this is happening. I cannot believe this is happening,’” she said. It was chaotic outside the school as parents and students rushed around trying to find each other, said Dusty Kornbacher, who owns a nearby floral shop. “All the parking lots were full with parents and kids hugging each other and crying and nobody really knowing what was going on,” she said. This story has been corrected. The total number of injured was 17, not 19, according to the Kentucky State Police. Dusty Kornbacher is a she, not he. Culp wrote a text message, not a private Facebook message. Associated Press contributors include Stephen Lance Dennee in Benton; Adam Beam and Bruce Schreiner in Frankfort, Kentucky; Rebecca Yonker in Louisville, Kentucky; Jonathan Mattise in Nashville, Tennessee; and Michael Warren and Lisa Marie Pane in Atlanta.